Illumination is essential to both safety and to the ability of miners to perform their work. This is easy to understand given that 80% of perception is visual. Open flames were used from the earliest days of mining. Carbide lamps were developed in the 19th century. During the early 1900s, electric lighting was introduced into underground mines in the US. Safety was the driver for these changes given the pervasive occurrences of explosions caused by mine gas ignition. Today, light emitting diode (LED) technology is poised to revolutionise mine illumination. R&D LEDs are achieving up to 276 lm/W in comparison to about 15 lm/W for an incandescent (INC) bulb. Miners depend most heavily on visual cues to see hazards associated with STFs (Slips, Trips and Falls), moving machinery, and other hazards. Mine Safety and Health Administration (MSHA) accident data for 2007-2011 indicates that STFs are the second leading accident class (18.9%, n=2,301) of nonfatal lost-time injuries at underground US mines, and resulted in 141,960 total days lost from work. Pinning/striking accidents also occur frequently: 33 fatalities involving a continuous mining machine (CMM) occurred from 1984 to March of 2011. Age is an important factor for mine illumination5. A US mining workforce survey indicated that the average miner age is 43.3 years. As the mining workforce ages, the need for effective underground lighting becomes even more important for safety. Glare is also an important factor. Crouch reported that 78% of the miners interviewed complained about or questioned the lighting systems in mines relative to discomfort and disability glare, veiling reflections, and afterimages. 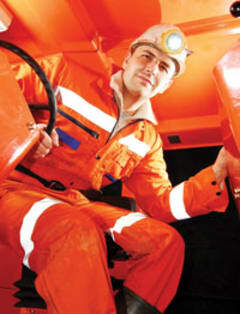 Crouch estimated that miners working at the coal mine face could experience a 40% or more loss of visibility from glare. Cap lamp research for a simulated coal mining visual environment indicated about a 50% increase in discomfort glare for subjects more than 50 years old as compared to a group of younger subjects (mean age of 22.6 years). This article summarises NIOSH (National Institute for Occupational Safety and Health) mine illumination safety research for machine-mounted lighting and LED cap lamps, and investigates lighting to improve miner escape and rescue in smoke. The results are from human subject testing in the NIOSH mine illumination laboratory located in Pittsburgh, PA, USA, unless otherwise stated. Because age is a factor, the following categories were established in order to quantify the effect of age on visual performance of young (18-25 years), middle (40-50 years), and older workers (51+ years). Volunteers who had radial keratotomy, monocular vision, glaucoma, or macular degeneration were excluded. As part of the acceptance criteria, volunteers had to pass vision tests for distance visual acuity of 20/40 or better, contrast sensitivity of 1.72 to 1.92 values of log contrast sensitivity, the absence of colour vision deficiency, and peripheral vision of at least 80˚ for each eye. Machine mounted area lights provide illumination around the machine to enable miners to see moving machinery and STF hazards. A comparative study was conducted using INC, fluorescent, and LED technologies to create area lighting combinations. Visual performance was quantified (time and accuracy of detection) for the detection of movement in the peripheral field of view and for the detection of tripping hazards. The results indicated that the young age group produced average detection times 27% to 18% faster than the older age group for peripheral motion and tripping hazard detection, respectively. The lighting combination of fluorescent and LED lights resulted in the fastest detection times for the peripheral motion study, where the average detection times were 12% to 14% faster than for the other lighting conditions; trip hazard detection improved 6% to 7%. The visual warning system, or VWS is a safety intervention to reduce CMM pinning/striking accidents. The VWS identifies the impending machine movement based on the CMM control inputs and determines the CMM areas that pose pinning/striking hazards. Next, it activates red LED warning luminaires in those hazardous areas and indicates the type of machine movement such as forward, reverse, pivot, and turn right or left. Human subject testing indicated dramatic improvements using the VWS. For instance, for the forward and reverse movements, the average detection time decreased 1.47 seconds (75% improvement); for pivots, the average detection time decreased 1.76 seconds, which translates to a 5.63º pivot. To give context to the importance of these results, our analysis of 33 CMM fatalities indicated that 30 fatalities involved machine forward, reverse, or pivot movements. NIOSH conducted LED cap lamp research in two phases: Phase I enhanced the light colour to improve visual performance; Phase II addressed the lighting distribution such that floor and moving machinery hazards received more illumination. In general, as age increases less light reaches the retina. One method to address this is to increase illumination; however, this has the negative effects of increasing glare and decreasing the availability of battery power for battery powered lighting. Our approach was to manipulate the visible light colour spectrum of a cap lamp so that the light is perceived as brighter, although the luminous flux is the same as measured by mesopic photometry. At low-light (mesopic) conditions, an increased short-wavelength spectral content can improve visual performance because the eye is more sensitive to short wavelengths of visible light. NIOSH developed an LED cap lamp that used cool-white LEDs that emit more short-wavelength light as compared to warm-white LEDs or INC lights. The results of a comparative study using an INC cap lamp, a commercially available LED cap lamp, and a NIOSH prototype LED cap lamp indicated significant improvements for older subjects when using the NIOSH prototype LED cap lamp. Moving hazard detection improved 15.0%, trip hazard detection improved 23.7%, and discomfort glare was reduced 45.0%. The cap lamp lighting distribution has traditionally been provided by a single light source along with a circular optical reflector to direct light as a 6˚ to 10˚ spot beam (Figure 1, left). This spot beam provides a tunnel vision visual environment that limits peripheral vision, given that it provides very little illumination of the floor or mine ribs. To address this, NIOSH developed a prototype LED cap lamp having a radically different beam distribution (Figure 1). Multiple LEDs with secondary optics are used to direct the light to better illuminate STF hazards and moving machinery hazards. The cap lamp beam distribution and intensity are software controlled. This enables the flexibility of matching the cap lamp lighting to the task at hand. For instance, the visual needs vary between a CMM operator and a mechanic. Currently, cap lamps have a ‘one size fits all’ approach where a tight spot beam is provided regardless of the visual task. NIOSH researchers conducted the investigation by comparing two commercially available LED cap lamps and a NIOSH prototype LED cap lamp. The cap lamps had similar spectral power distributions; thus, the visible light colour was not a factor. Visual performance was quantified by measuring times of detection for seeing rotating targets in the peripheral field of view, which is important for detecting moving machinery hazards. Results indicate the NIOSH prototype LED cap lamp improved peripheral motion detection up to 79.5% and up to 94% trip hazard detection without increasing discomfort glare. Building on the successes of the above experiments, we inferred that as floor illumination increases, walking speed would increase and head pitch would decrease; that is, the better that miners can see the floor, the faster they can walk and the less they need to pitch their heads down to illuminate the floor with their cap lamps. Less head pitch enables a better forward field-of-view so that miners can better see hazards in front of them. A pilot experiment was conducted at an underground mine and was followed by in depth laboratory testing. The primary objective was to determine if the light beam distribution from the NIOSH LED cap lamp affected average walking speed or head pitch. A commercially available LED cap lamp and the NIOSH LED cap lamp were used. Each subject wore an instrumented hardhat fitted with a 6-axis, wireless inertial measurement unit that transmitted head tilt data to a laptop computer. The field test results indicated a 2º decrease in head tilt when using the NIOSH LED cap lamp. While this improvement appears small, it translates to a significant extension of 0.46 m (18.1 in) for the line-of-sight intersection with the floor. Laboratory results indicated about 5.4º decrease in head tilt when using the NIOSH LED cap lamp. This translated to a line-of-sight intersection with the floor of about 0.97 m (38.2 in). Field data indicated no difference in walking speed. Laboratory data indicated a small, statistically significant increase in walking speed when using the NIOSH LED cap lamp. The field environment had a mine roof height that undulated significantly, causing some miners to occasionally stoop or bend their head; thus, head pitch and walking speed data were affected. Overall, we infer that the distribution of the light from the NIOSH LED cap lamp more positively affects head tilt and walking speed by providing better illumination. The latest research addresses the unique needs for metal/nonmetal mining where the visual environment and visual tasks are different compared to coal mining; hence, an LED cap lamp for metal/nonmetal miners is being developed. The cap lamp builds upon the knowledge gained from earlier NIOSH research and from feedback obtained during metal/nonmetal mine field trips. The cap lamp is a hybrid that combines the multi-beam distribution with an intense spot beam (Figure 2) useful for distance viewing. Various visual cues are used to help miners escape from a smoke-filled mine, and these same visual cues are used during rescue. The Code of Federal Regulations (CFR) of the US government requires at least two separate, distinct, and clearly marked escapeways be provided. The colour, size, and spacing of the escapeway markers are not specified so they vary significantly among US mines. Typically, escapeways are marked with reflective ceiling tags. Miners also look for mine rail tracks as a visual cue. To date, there has not been research to determine the visibility of escape cues in smoke conditions. The purpose of this research was to determine which colour ceiling tags (red, blue, and green colours) are easier to see in smoke using different cap lamps (LED and INC) or Class IIIa laser pointers (red, blue, and green). Three cap lamps were used: an INC, commercially available LED, and NIOSH LED cap lamp. Testing was conducted in a smoke chamber at the NIOSH Mine Illumination Laboratory. The chamber was constructed to isolate the subjects from the smoke. A window enabled the subject to see into the chamber. Test apparatus located inside of the chamber included red, blue, and green ceiling tags on a continuous chain loop mounted to the ceiling, and a moving section of track on the floor. The ceiling tags and track travel towards the subjects to simulate a person walking through a mine. Theatrical smoke was used. The density was controlled via an optical-sensor based system. Subjects stood at the window with their chin on a chin rest to enable a consistent field of view. Subjects used a pushbutton to start (push on) and stop (release) the tests when they detected a target (ceiling tag or rail track) approaching them through the smoke. A sensor and data acquisition system was used to measure and record the detection distance between the subject and the detected target. This detection distance was used to determine visual performance. Greater distances indicated better visual performance. Results indicated complex relationships among the cap lamps and lasers, the target type, and subject age; however, a number of important findings are evident. Cap lamps were superior to lasers for ceiling tag detection with the exception of when using the green laser. The INC cap lamp worked best for detecting the rail track but for only the youngest subjects. The INC cap lamp provided a warm-white light which results in better colour rendition that could have been apparent to only the youngest subjects. The green laser was the best, followed by red, then blue for detecting the ceiling tags and rail track. The green ceiling tags were the easiest to detect, followed by red, then blue. The track was easier to detect than the ceiling tags, where the average detection distances were 2.50 m (98.48 in) and 1.88 m (73.90 in), respectively. While several important findings emerged from this research, several limitations existed. The white theatrical smoke could differ from mine fire smoke. Variations in smoke density and reflectivity could exist. Secondly, three commonly used ceiling tag colours were selected. Twelve colours are available, so it is unknown if other colours are better. Improving the safety of miners through better illumination continues to be our goal. Our approach was twofold: use scientific methods for designing and conducting human subject tests that enabled quantification of the effects of improved illumination; secondly, develop lighting that could improve a miner’s visual performance for hazard detection as compared to commercially available lighting for the mining industry. The cap lamp test results indicated significant improvements for detecting STF hazards and moving machinery hazards when using the NIOSH LED cap lamp. The results of the machine-mounted lighting testing indicated significant improvements for detecting hazards when using the VWS and LED area lighting. Illumination is essential to mine safety, and it can affect a variety of safety areas as evidenced by the diversity of our research. Much has been learned and much advancement in mine illumination has been realised; however, there remain many opportunities to improve safety.